Sage and onion stuffing seems to be the norm for stuffing a Christmas turkey, but what about using thyme? A Google search produced 9 million results! A quick look through the first five pages of the search shows that thyme can be mixed with a variety of plants. The most common are : onions, parsley, apple, lemon, orange and chestnuts. But what exactly is thyme? 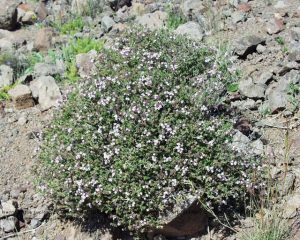 Thyme or to provide its correct botanical Latin genus name: Thymus vulgaris L.  is a member of the Lamiaceae (mint family) and according to Mabberley  thyme is distributed from the West Mediterranean to South East Italy. 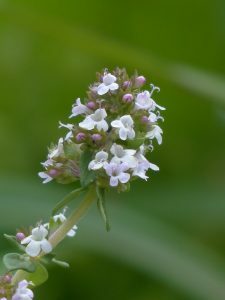 Thyme (also known as common thyme or garden thyme) is an aromatic perennial evergreen shrub which prefers to grow in well drained neutral to alkaline soils in full sunlight. The RHS Dictionary of Gardening describes the plant as “shoots 30cm, vertical, often branching, lower parts woody. Leaves 8 x 2.5mm linear to lanceolate, pubescent below, revolute. Flowers crowded in whorls, bracts similar to leaves, grey green. Calyx to 4mm campanulate. Corolla white or purple.”  The entire plant is aromatic hence the use of its many plant parts in cooking. Well its thyme to wrap up this article. I wish you all a happy holiday season and New Year and I hope you have a great thyme with family and friends! 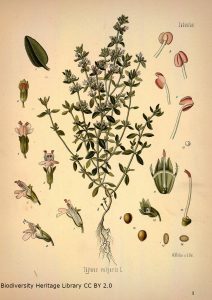 There are several species and hybrids of Thymus used for culinary purposes. Flavours can differ based on the species and cultivar being grown.